OOP’S! I SEEM TO HAVE ACCIDENTALLY DELETED THE LAST POST. 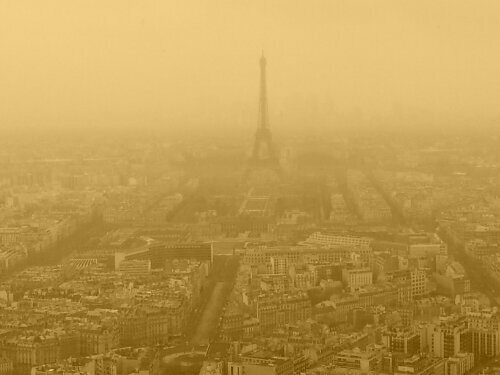 But it has left behind this misty picture from the 56th floor of the Tour Montparnasse. Obviously was not meant to be! But here is what I was doing a year ago. Tags: eiffel tower from tour MONTPARNASSE. Bookmark the permalink. Previous post ← CONVERSATIONS WITH PEOPLE I ADMIRE. “RASHIDA”……. What happened? I was coming to comment and couldn’t find it anywhere. Deleted? Shoot!! Anyways, I couldn’t finish reading it because my head is still in the freaking clouds with this cold, I can’t concentrate on anything! That photo IS really spooky, wow! I’ve been waiting for your posts on Paris! Love the picture and now, I must finally visit the Tour Montparnasse!